Why does Robert use BullCharts? Robert uses the Australian BullCharts software for a whole lot of reasons. All the features listed below add up to a great software package. Australian designed and developed software. Company based in Sydney (Australia). The BullCharts company has been around since 1995. Prompt user support is available by email or phone. Australian BullCharts User Group with monthly meetings in Oakleigh (Melbourne), and a monthly online webinar version for all users. Online information available for users at the BullCharts Yahoo Forum. Various training and support, including Robert's Getting Started page, and the Next Steps. using the "Quick News Search" toolbar button (see image at right). See more details and sample below. 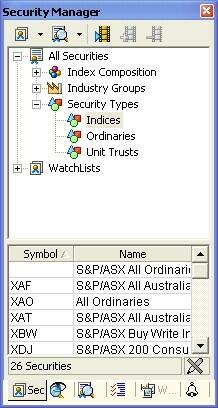 Watchlists - Very easy to create and maintain multiple watchlists. Have one Watchlist of your favourite stocks to watch, and one of stocks currently invested, and one for each sector or category of stocks you are following (eg. your favourite mining stocks, or biotech stocks, or banks, etc.). Have many more if you want (and group them into folders) - more on watchlists below. Slideshow - Quickly and easily view a price chart of each stock in one of your watchlists - more details below. Hot stock? 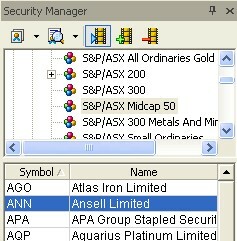 - In the watchlist list of stocks, flag a stock by applying a colour background to the watchlist entry - see sample below. Technical chart indicators - Many indicators are built-in - simply use your favourite ones and ignore all the rest. Add your favourite indicators to the Indicator Toolbar to make it very quick and easy to apply them to a chart - more on indicators below, and at right. Templates - Save the "layout" of your preferred chart for quick application again later, and add your favourite layout to the template toolbar. Create several different templates - perhaps one for daily, one for weekly, one for monthly. Or perhaps one with a trend indicator included, and another with a momentum indicator - more on templates below. Annotations on the chart? - Quickly apply text, or trend lines, or Fibonacci tools, or other line studies, etc. to a price chart, and save them for later viewing - using the IntelliCharts feature, or use the "File>Save" option to save the chart - more on IntelliCharts below. Quickly save comments for a stock - Use the Comments field in the Watchlist entries, or use the Chart Memo feature - more on Chart Memo below. Workspaces - If you like to view two or three price charts on the screen, arranged in a particular layout, then save the layout as a Workspace. Then use the Workspace Manager to quickly apply one of your favourite Workspaces - more on Workspaces below. Multiple monitors? - It's easy to "Float" a price chart to another monitor, and then save the total layout as a Workspace. Market scans - Easily create or customise a scan, specifying your own selection criteria, and automatically scan your preferred list(s) of stocks to produce a short list of the stocks that match your selection criteria today. Easily arrange your favourite scans using the Category or Author groupings - more on scans below. Author Strategies - We have done the hard work for you. Many stock selection strategies are already supplied as market scans, as well as the indicators that are used by many famous traders, analysts and book authors. These are referred to as Author Strategies - more on Author Strategies below. From version 4.2, using the open source SQL database for multiple markets data storage. Up until version 4.1, using the latest Microsoft .NET application development architecture and technology. Up until version 4.1, using the secure and corporate-strength Microsoft SQL server database technology to store security data on your local computer. Also see Robert's "Pink Information Sheet" for a 2-page summary list of features. For more information about some of the keywords used here, refer to the items in Robert's BullCharts KnowledgeBase. These are just some of the indicators already included in the BullCharts software. It is a long list, so you should identify a couple of useful ones, and stick with them and ignore the rest. Easily apply trend lines, text notes, circles, arrows, Fibonacci Retracement or Extension, price change ruler, and many more. IntelliCharts - will automatically remember the text, chart tools and indicators that you apply to a particular stock (can be easily turned off). Chart Memo - use this feature to record notes about a stock. Save the chart and all its features as a disk file for later retrieval. Over 50 built in tools, including squares, circles, line segments, arcs, fans, Fibonacci tools, Gann tools, Andrews Pitchfork, Count Back Line, Trend Ruler, etc., etc. Common chart types - OHLC Bars, Candlesticks, Line, Point & Figure. More chart types included: Gann Swing, Kagi, Renko, Three line Break, Equivolume, Candlevolume, Stepped, Points, Pretzel. Semi-log chart - apply log scale to vertical price axis. 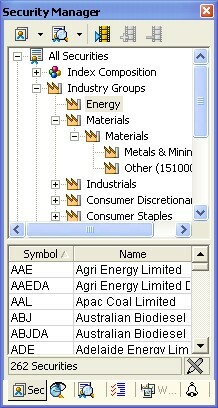 pre-loaded lists of all stocks within GICS sectors (see the screen shot sample at far right for the Energy sector). Easy to create one or more watchlists, and to keep the watchlists in specific folders or sub-folders (see sample at right). A watchlist might be a list of stocks that you are following and which are possible candidates for investment, or it might be your current share holding(s). Easily add one, or many, stocks to a watchlist. Easily copy all stocks from one index or sub-index into a watchlist. Lots of watchlists? Easily organise them into Watchlist Folders. Slideshow - View a chart of each stock in a watchlist using the Slideshow feature (see screen shot below). Click to start the slideshow, and step back and watch. Going too fast or slow? - simply click on the button to speed up, or to slow down. These buttons are across the top of the Security Manager window pane (in the screen shot below). 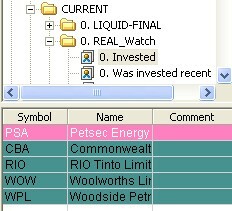 the watchlist entries by colour, or symbol, or name. available from the ASX web site. 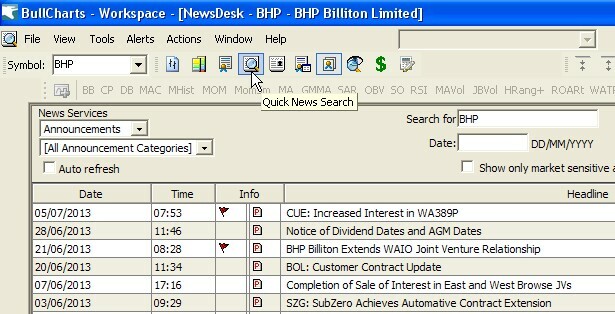 In BullCharts, use the "Quick News Search" toolbar button - see the screen shot at right, and click on the image for a larger version in a new window. Actions > News > Quick News Search. Lots - more than 270 (see list above right). Use the few that you like, and ignore the rest, or experiment with different ones. A template is the look and appearance of a single price chart (the style of the chart). Store several different templates (chart styles). Customise the Template Toolbar by adding your own templates, and removing the standard ones. Create and run a special set of selection criteria and search through a selected group of stocks to find those that match your criteria. The resulting list of stocks is available for you to research further for share purchase consideration. Many scans are already supplied with the software (more than 100), including some Author Strategy scans. Scans are very easy to modify, or create your own. Use drop-down boxes and selection lists - no programming required. Much easier to use than competitive products - without mentioning any names. Can use scripting tool for serious customisation if desired. This feature was added in v3.8. Set alerts on price or volume. Set alerts on any of the Close, Open, High or Low price values for the period. Drop a sloping Alert Line onto the chart - either on the price pane or the volume pane. Set BullCharts to alert you when the price (or the volume) rises above the line (or falls below it). If you have very unique or special requirements, you can use the supplied programming language (BullScript scripting tool) to seriously customise Scans or Indicators, or to write your own. The trading strategies of many famous traders and authors are implemented in Scans, Indicators, and chart tools. Referred to as Author Strategies. Back-testing features are available using TradeSim software (from CompuVision Australia Pty. Ltd.) with good integration with BullCharts. Or you can run the scans "as at" a prior date. a larger jpeg image version. Zoom in and out on the price chart is easy (with toolbar button, or the mouse wheel). Extend or collapse the vertical price scale (by dragging the axis). If you have a number of drawn elements on a price chart (eg. text, lines, indicators, etc. ), use the Layer Manager to temporarily "hide" some or all of these items in order to study some aspects of the price chart better. Feature added with version 3.8 to help manage a number of WorkSpaces (a WorkSpace is the on-screen appearance and layout of multiple price charts, including across multiple display monitors). Trade Planner - to help you work out your likely Reward:Risk Ratio, or optimum position size, or other trade parameters (new in version 3.8.7). End of Day data plan - is the most common, and gives a data download and update after 7:30pm each trading day. Snapshot plan - Download a snapshot of the share prices on the hour (but download 20 minutes after the hour to avoid extra ASX royalty payments). 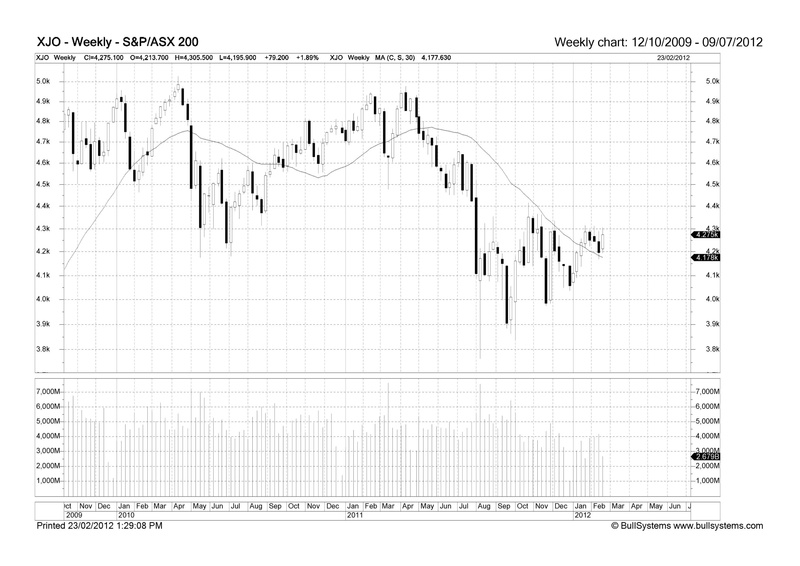 For more information about the snapshot plan see the BullCharts FAQ. Dynamic Live data - display intra-day chart with live data streaming over the web to update the chart in real time. Can show data intervals of 1, 2, 5, 14, 30, 60, 120 minute intervals, with real-time live updating as trades take place. © Copyright 2010-2016, R.B.Brain - Consulting (ABN: 52 791 744 975). Last revised: 19 June, 2016.